Location is curated by Ruth Hogan who presents four artists engaging with concepts of landscape through the relation of space to the self. These artists are Jonathan Sammon, Lisa Flynn, Michelle Horrigan and Elaine Reynolds and their work is delivered through a combination of drawing, photography and Video. The exhibition is balanced in the gallery’s 3 areas and is well designed in emphasising the elements of place, wandering and discovery that accompany the varied subject matter of ‘Location’. The statement for the exhibition refers to a collective positioning of intent by the participants through the phenomenon of ‘Psycho-geography’. The term ‘Psycho-geography’ originated in the late 50s and by the 60s in one of its many interpretations it became a lateral tool of anti-capatilist resistance used by the group of mainly French creatives who designed its outlines. Its popularity in art circles stems from the visual research methodogies that have been suggested in the various documents associated with the group. In their writings these ‘Situationist’ writers such as Guy Debord encouraged wanderings and skewed storytelling to develop surreal associations between the urban landscape and a wanderer’s conception of a journey. These exercises came to be documented as reconfigured maps and collaged photoworks in which juxtapositions of certain areas and states of mind achieved significance as a result of ‘psycho-geographical’ investigation. While not a studied disipline, its ethos has increasingly become a reference in many contemporary projects where the communication of an artist’s involvement with place is integral to the reception of the artwork. Positioned as such the work in ‘Location’ can be experianced both as research documents on the above theme and as individual works referencing its ethos. As a whole these results respect the lateral overlapping that occurs when it is the artist’s intention to focus themselves (in and out of character) when engaging with both the conventional and emotional history of a chosen place. 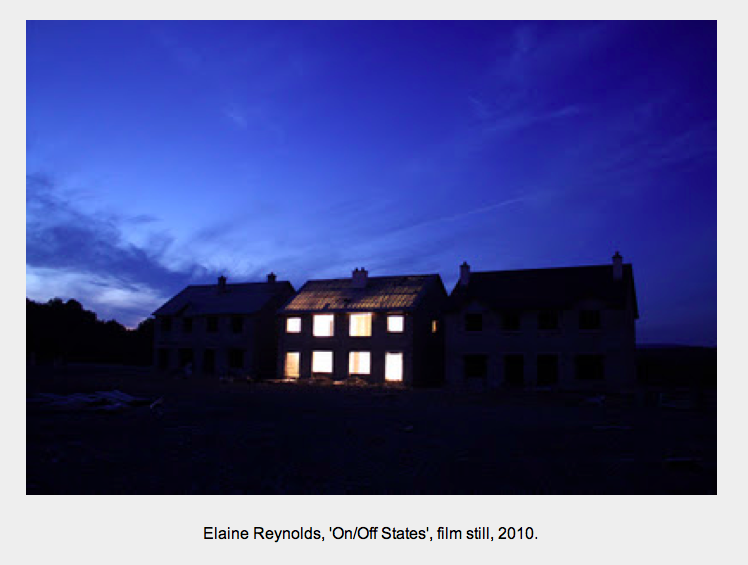 Elaine Reynolds’s video in the blackened Gallery 3 animates an unoccupied house in an Irish ghost estate at night. In ‘On / Off States’, lights dramatically flash the SOS pattern in morse code. There is the appearence here of something that subverts the conventional image of a ‘mad party’ on the estate should the developer’s dream of that estate come to pass. Without any sound to direct us otherwise we are left to deal with the scene’s silence as it becomes a visual echo for the chosen landscape and all associated with it. In its darkened gallery setting, a documentary impression now appears to suggest the holding of a captured warning beacon. The artwork speaks of ‘systems set to a new purpose’ refering to the artist’s personal interest in fallen economic remnants. More so the simplicity of Reynolds’s performative intervention presents ‘On /Off’ States as an effective, accessible and direct polemical comment on the psychic legacy of the Celtic Tiger. In a direct micro contrast some of Lisa Flynn’s close-up video work ‘Drawing Breath’, ‘Hello Stranger ‘ and ‘Untitled Breath’ in Gallery 1 focuses on detailed imagery of the body. By the nature of its filming the work invites a response akin to intimately following a drawing in progress. Her screens on the back wall now become the curiously interactive visuals that by location can be seen to speak first to the gallery’s window and street beyond. Johathan Sammon’s boundaries can be regarded as traditionally ‘darker’ representing the sometimes heightened sensory psycho-geographic readings of landscape made familiar by writers like Ian Sinclair and WG Sebald . The gothic graveyard looming in Sammon’s film ‘A Merry Peal of Celebration’ flickers between a 50’s B movie Hollywood set and a sort of 3D european fairytale. In his presented visual notes it appears the landscape itself has to be unpacked before a path can be traced. His statement mentions emotional detatchment. 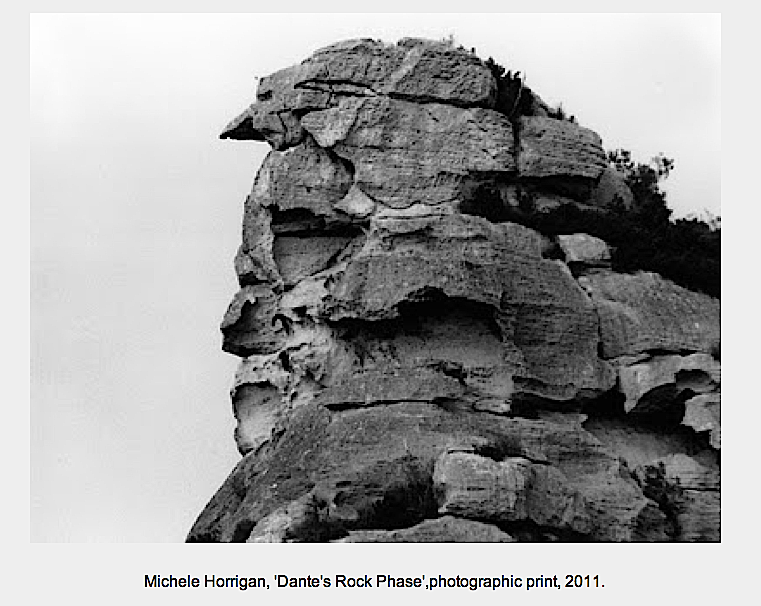 Gallery 2 hosts photos, graphics and a video by Michelle Horrigan who presents a poetic fusion of biographical details of the poet Dante and the landscape of Baux de Provence. 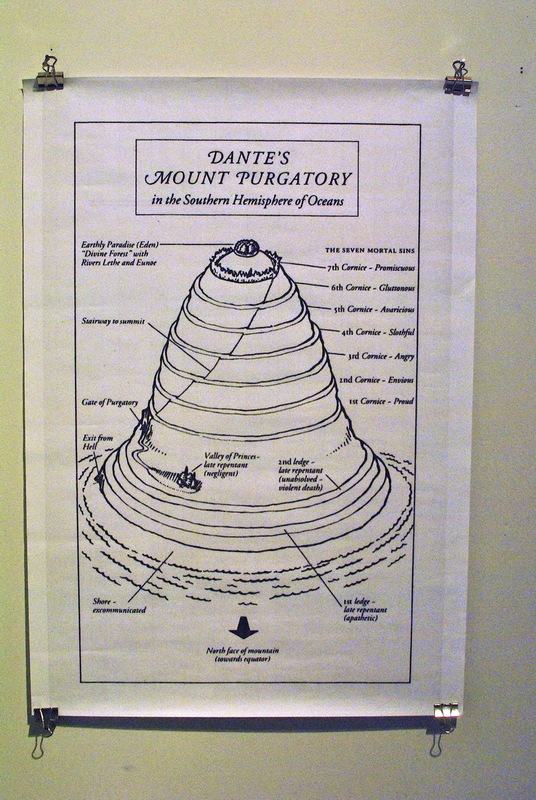 This landscape with its representational rock formations is said to have been an inspiration for the ‘Purgatorio’ section of his Divine Comedy. Her cinematic video ‘Purgatory’ is a true almost acedemic example of the wanderer making observations, links and formulating a many stranded narrative speculation towards a work that in its final form transends the investigative process undertaken for it. This engaging show reflects well the curator’s intention to present artists who explore self, identity and place through a prism of landscape without overly referencing the august tradition of ‘Landscape Art’ in an Irish context. The concept of destination is also collectively questioned in the respective pieces by a variety of macro and micro strategies and this is one of the exhibition’s many strengths. Location also succeeds as an introduction to the fluid ‘almost practice’ of Psycho-geography by contemporary visual artists.